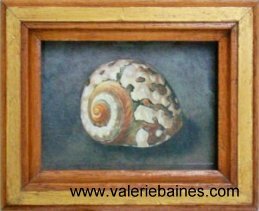 Valerie Baines has drawn and painted as long as she can remember and has always had an interest in the wild-life around her. 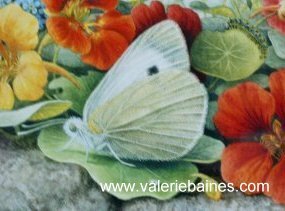 As a school-child she reared butterflies (especially cabbage whites, because she didn't like cabbage) and kept various pets, who were models for drawings and paintings. 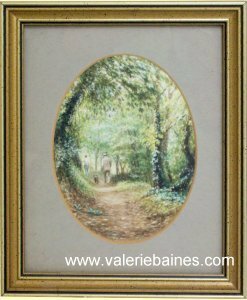 She now lives in Sussex, and finds much inspiration in the countryside around. 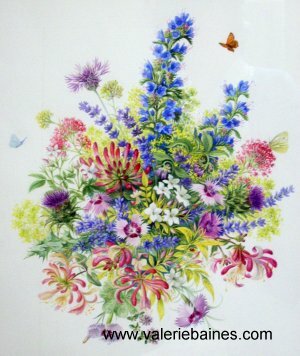 She went to Harrow Art School, and the Royal College of Music, and then became a designer in the studio at Sandersons, where an aptitude for design and flower painting is essential. On leaving Sandersons she continued free-lance designing and illustration. 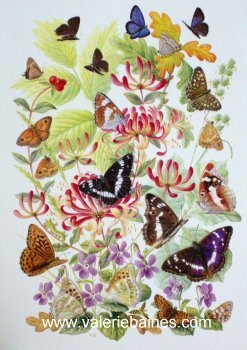 She has illustrated over ten books concerned with Natural History, including "The Naturalist's Garden" and "The Story of Silk" by John Feltwell, "Glorious Butterflies" for Butterfly Conservation and "Mindful of Butterflies" by Bernard Jackson, butterflies becoming something of a speciality. She has written articles for magazines on drawing and painting in watercolour, and gardening for butterflies, and tutors courses on painting at Pashley Manor, Ticehurst, Sussex and Juniper Hall Field Centre, Dorking, Surrey, where there is the butterfly garden full of nectar and larval food plants that she has designed for the Surrey and S.W. London branch of Butterfly Conservation. Biographical entry "Who's Who in Art" 1995 et seq. 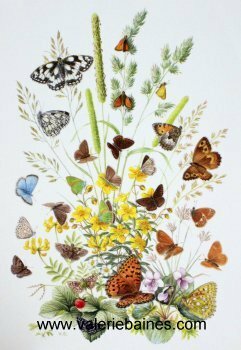 Seleccione de Illustraciones de The Society of Botanical Artists. "The Art of Botanical Painting." In association with The Society of Botanical Artists. "The Botanical Palette." In association with The Society of Botanical Artists.